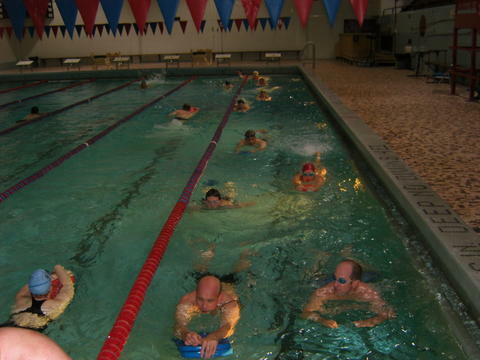 As you pound the slippery pavement or nurse skinned knuckles trying to get the wind trainer set up in the basement, all to keep your training going over the winter months, remember that winter presents a perfect time to stay inside and work on your swimming technique. Why take to the water? By and large, the swim, while it’s the shortest part of the triathlon, is also the leg of the race that fills athletes with the most trepidation. Part of this is probably because it comes first, and you have what seems like hours to stand on the beach and think about it prior to your wave start. But also, since practicing the swim takes special preparation (gotta find a pool with lap swimming hours that work into your schedule, gotta find the right goggles that fit, gotta find a swimsuit you don’t feel mortified to wear in public), it’s easy to give it short shrift. But swimming has benefits you don’t get from running or biking. Because it’s low impact, it’s easy on your joints, but believe me, it is still possible to get one heck of a cardio-workout in the pool and burn a lot of calories. Plus, it’s a lot harder to break an ankle in the pool than it is on an Iowa sidewalk, something your your humble editor knows from personal experience. In your past training, you may have focused on swimming in the summer months, when it’s easy to find a public pool open for noon or evening lap swimming. But if you really want to improve, the way to do it is not long, slow easy laps in the sunshine. A good swim workout is designed like a track workout is for running, with repeats on a variety of interval and effort levels. Make a pre-New Years resolution to get more comfortable in the water by scheduling some pool time. You can swim on your own at your local Y or community pool, but for the best experience, hook up with your area Masters swim team. There are several Masters groups in Iowa. Milky Way Masters in Cedar Rapids, The Iowa City Eels, Quad Cities, Des Moines and several others around the state. 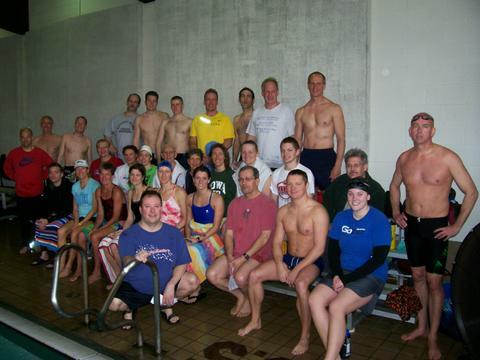 The state Masters swim organization, IowaMasters.org, has more information. Many clubs have free introductory trials so you can check them out before joining. Masters clubs around the state are all affiliated with United States Masters Swimming, a large organization dedicated to adult competitive and recreational swimming. If you haven’t visited usms.org, do so, whether you intend to join or not. The site has a wealth of information, including training tips and workouts. You won’t be. Think of a Masters meet like you do a fun run. You’re not after a new PR, just a chance to elevate your heart rate a little in a new environment, and hang out with some fun people. A Masters meet fits the bill. You don’t have to know any strokes other than crawl/freestyle to race. You don’t even have to do flip turns! You can race distances from 50 yards all the way up to a mile (a great distance for triathletes cross-training), and also team up with others on relays. Meets generally only last 2-3 hours, so the time commitment is not huge, either. There are several Masters meets scheduled for the winter and early spring. You don’t have to be affiliated with a Masters team, although you will have to join USMS (which can be done at the meet itself) to participate. I do recommend hooking up with a Masters group prior to the meet, to get used to pool swimming and have some people you already know to sit with in between events. Again, Iowa Masters has the meet schedule for our region. Spend some time in the pool this winter, and you’ll be able to approach the pre-race meeting on the beach next season calm and confident. Dennis Green, chief editor of Heart of America Triathlon News, took up swimming at age 40, having never swum in high school or college. But now you can find him in the pool most mornings at 5:30am, working out with Cedar Rapids’ Milky Way Masters.